– From the modern installer with the exception of the required minimum cut Adobe Desktop Common module, installed by the original installer on a mandatory basis. – I made an amendment to the old installer, which allows me to bypass the problem of conflict of the installed and installed version of the Visual C ++ 2015 Redistributable package that is relevant to it. – If possible, all language packs are excluded from the installation kits, except for Russian and English. – Product Adobe Acrobat Pro DC updated to version 19.010.20064. – Product Adobe Photoshop CC 2019 64-bit updated to version 20.0.1.41. – Product Adobe Illustrator CC 2019 64-bit updated to version 23.0.1.540. – Product Adobe Illustrator CC 2019 32-bit updated to version 23.0.1.540. – Product Adobe Premiere Pro CC 2019 updated to version 13.0.2.38. – Product Adobe Lightroom Classic CC updated to version 8.1.0.1200465. – Adobe XD CC product updated to version 13.1.32.8. – Adobe Camera Raw for CC has been updated to version 11.1.0.79. 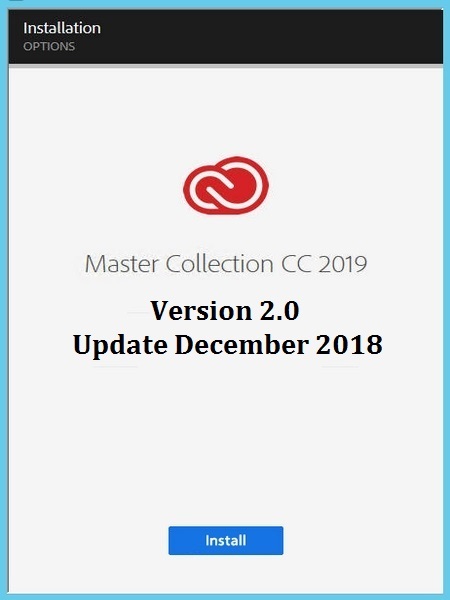 – Adobe CCX Process has been updated to version 2.5.2. – Adobe Extension Manager CC patched in a special way, so that it now recognizes and can work with the latest versions of Adobe products. – Every single program has already been treated. Can be used immediately after installation. Start windows (initial screens) for all programs, except Premiere Pro CC 2019, work.